With San Diego weather being bipolar lately, overly hot one day followed by cooler weather the next few days, one thing remains constant: I am always in the mood for ice cream. Pacific Beach remains one of my favorite places to explore since moving from Hillcrest. They have a Trader Joe’s, several places open to eat (usually with late hours) and the people watching is fun. On one trip, leaving Pacific Beach, I noticed a line snaking around a shop’s front that prompted investigation. 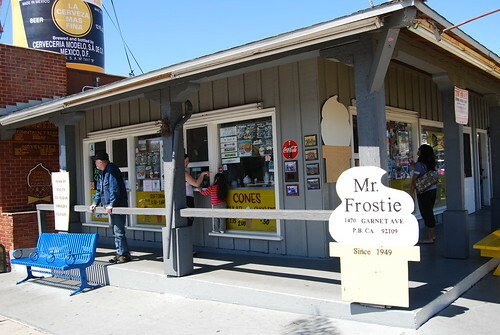 It turned out to be Mr. Frostie, apparently a Pacific Beach institution since 1949. Mr. Frostie serves a variety of things, including sandwiches, hot dogs and chili, but the main draws are their cool treats. The menu is all over the place but if you’re looking for the basics, look no further than either a vanilla or chocolate soft serve and start from there. Soft serves start at $1.25 for a small, $1.50 a medium and $1.75 for a large. 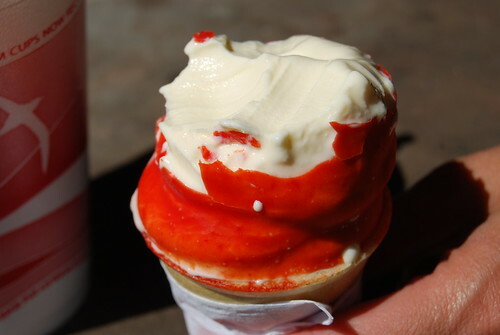 But if you need a little more, there’s an additional $.50 to have the cone dipped in chocolate, butterscotch or cherry. The dipped layer gives it a cool look and added flavor, but does nothing to prevent melting. Eating it fast is of utmost importance, as evidenced by my half-eaten cherry-dipped vanilla cone. The soft serve is what you find at most places with nothing particularly extraordinary about it but knowing this place has been doing it forever makes it special. As for sundaes, there are several to choose from, all starting from a vanilla or chocolate base. Two examples were their Nutty Nutty and Dirt Cup. 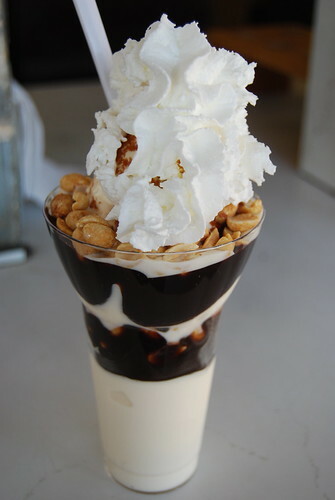 The Nutty Nutty ($4.25) is soft serve topped with hot fudge, roasted peanuts and a generous helping of whipped cream. It’s a nice treat that doesn’t skimp on hot fudge or nuts. The Dirt Cup ($2.50) is chocolate bomb through and through. 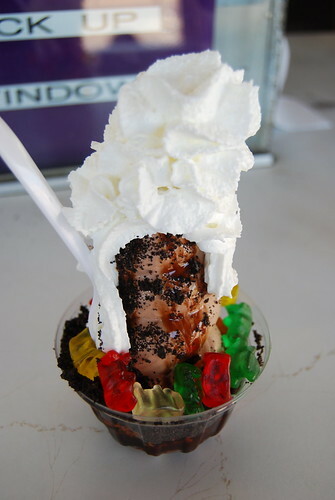 Chocolate soft serve is surrounded by crushed Oreo crumbles, Hershey’s chocolate syrup, gummi bears and whipped cream. I never got the notion of putting gummy bears onto ice cream or frozen yogurt and even after this, I’m still a bit bewildered. The gummi bears texture becomes tougher and the added fruit flavor distracts from the chocolate. In addition, I wonder if they were out of gummi worms because it would have made a lot more sense considering the name. Custards, shakes, freezes and other treats round out the menu. Tight parking can be found adjacent to the walkup window and yellow picnic benches are convenient places to hang out to eat your treats. I’ve walked by this place so many times but never gone in. 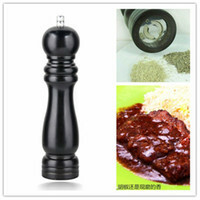 There’s usually a big line, I’ll have to check it out soon: thanks for the tip! If you’re in the area, give me a call and we can meet up for ice cream or whatever! Ooo! Butterscotch dip! 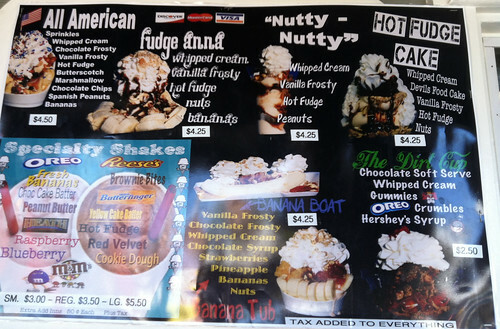 I think I hear it calling my name… The nutty nutty reminds me of the peanut buster parafait from Dairy Queen. I thought the Nutty-Nutty reminded me of a treat from somewhere else. Must add on my ‘go-to’ list! i know tc would love this place! and dipped cones? i am so there! It definitely helps there’s a small parking lot next to it too. And it’s not right in the central of PB. The parking there stresses me out! Considering it is a “Dirt” Cup, perhaps the bears are a stand in for the more common children’s dessert that uses chocolate pudding, Oreo crumbs, and Gummi Worms?